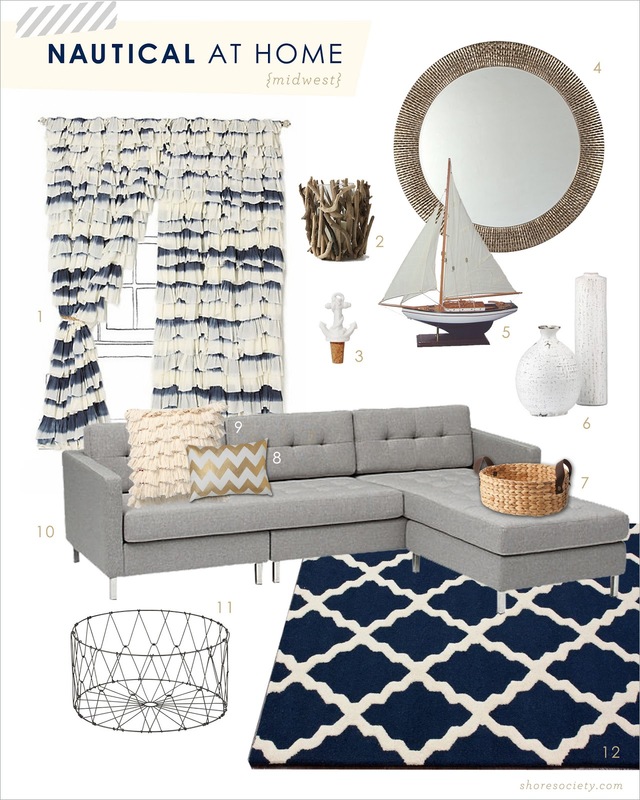 I knew the second we bought our house that I wanted to infuse a little dose of nautical into every room. Decorating with a theme in mind, however, can start as "nautical inspired" and end up in "seafood restaurant" territory rather quickly. I'm not one to shy away from a challenge, so I've decided to do a little blog series about nautical decor, broken up by different regions and inspirations. There is such a broad range of what it means to be "coastal," and the design influences vary as much as the geography. So I've started here in familiar territory—the Midwest—with a collection that looks a lot like my own living room. Midwest-inspired nautical represents those of us living along the Great Lakes, or an inland body of fresh water. It's not pastel, or beachy, or ocean-inspired, but goes a little bolder. Prints are more graphic, colors a bit richer (think navy or cobalt) and textured neutrals add that bit of "grit" that us Midwesterners are so familiar with. Industrial accents, like the wire basket, are functional and bring that rust-belt touch to the room. A bit of metallic gold here and there (like the chevron pillow and round woven mirror) adds a bit of sophistication. And, of course, you need a killer model boat for your mantle. Add in lots of white and natural colors, and you'll have a balanced look that keeps your graphic patterns from looking too strong. The driftwood candle hurricane shown here is actually from Anthropologie, but I did a DIY last year with driftwood from Lake Erie, which made it even more special! I linked to it under the image, if you'd like to give it a try. In the rest of the series, we'll cover the west coast, the east coast, and everything in between. I'm also open to suggestions about cities/areas/types of nauti style for future posts, so if you guys have requests, leave them below in the comments! They are seriously my dream come true. Which is probably why they're so damn expensive. 1. I'm with Emily. Those curtains. Ok, three--your home is absolutely beautiful! Haha, thanks – it's a real fear of mine! I actually really adore that little anchor wine stopper. Everything is so cute though, I love this series! I grew up in Virginia Beach, VA as part of a Navy family, so nautical is practically in my blood, haha. I do too, so badly! Well done! I was just eyeing a wire basket for toilet paper in the bathroom.